This short article complements the page in this link on placement on the Pitot probe on the nose of the fuselage. Here, we examine a Pitot-static installation on the leading edge of the main wing. The experimental approach is the only way to acquire accurate data for a particular airframe. Nevertheless, if the requirements for accuracy are not tight, an “upper-bound error” approach can be used. In the DIY world, one does not see often a Pitot probe placed on the wing, at the flying fields. However, this method of placement is adequate for a very wide flight envelope. Two approaches can be used to deal with static pressure uncertainty. The experimental approach consists of measuring the effective uncertainty as a function of all the relevant flight parameters. Afterwards, the real-time Pitot measurements can be corrected by the calculated errors. This approach will not be examined here. The second approach is applicable only if the requirements for accuracy are not tight. It consists of setting an upper bound for the uncertainty, based on third party experimental data. 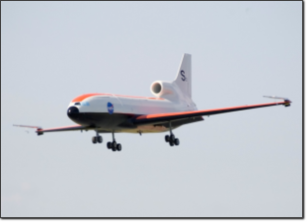 “NACA technical note 2311 Flight investigation of the variation of static-pressure error of a static-pressure tube with distance ahead of a wing and a fuselage”. The error magnitude decreases with the distance of the static port from the wing leading edge. Note that the error decreases faster for small, increasing values of . The error magnitude increases with , which is coupled with angle of attack. For rigorous testing, this relationship must be extracted for the desired Reynolds number. According to figure 7; for a DIY application, with the aim to have an overall airspeed measurement uncertainty below 5% of the total pressure, a distance is adequate. On the other end of the accuracy spectrum, take a look at figure 9. The value is two times the chord, and of course very good accuracy is expected. A length of that magnitude can be achieved with the Basic Air Data DIY air data boom or similar hardware.